Sunday's are for napping, just ask Rose. My heart is worried for sweet Abby from Manx Mnews. She's having some major health challenges. Please send prayers and purrs to the good humans and kitties over at Manx Mnews and especially for Abby. Absolutely. I prayed for them both..Abby and her mom. I know He hears us and I know He dweels within the believer so He hears every word and knows every thought. I prayed that they and three others for whom I am praying feel His presence. That is a feeling beyond any earthly riches. Rose looks adorable. Maybe I'll nap today too, when the boys are ready to settle down. You sure are having a pretty Easy Rose. We are all purring and praying for dear Abby, tis so very sad. We have been purring our best for Abby. Mommy lost a kitty to CHF so it's been hard for her. 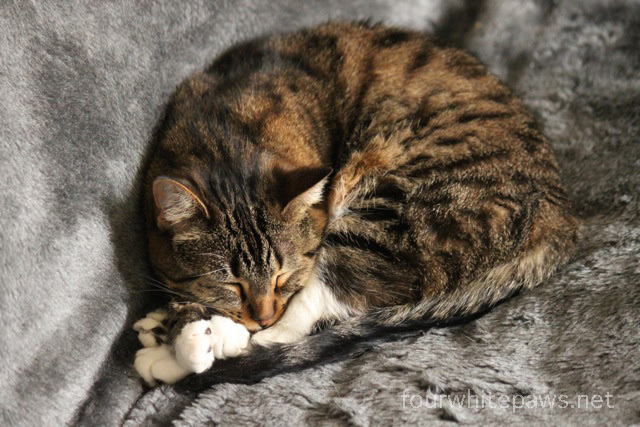 Miss Rose has the right idea, nap! I just visited her. Sending more best purrs to her. Abby is of my sweet heart. We is doing lots of that today too! I hope that Abby will be feeling much better really soon - she's such a pretty little girl! 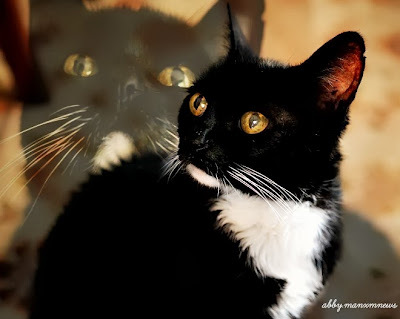 gorgeous photos and we are purring and praying for Abby with all of our might. Thank you for your lovely thoughtful posting about my dear girl. All of the love and concern for her is overwhelming me in a very good way. The support from our community has been so helpful to me and especially to Abby. I believe she knows all of her friends are praying for her. Thank you. (I absolutely love this picture of her thank you for sharin it)And Rose your toesies look very sweet I bet they would be good for a nibble!